Rockstar Energy Mayhem Tour is riotous road show featuring metal bands that have either recently released their albums or are about to launch a new album. Rockstar Energy Mayhem festival presents it audience with some of the hard music's popular artists and a plethora of the genre's most breath-taking young voices. The festival is scheduled to start off on July 9th. Seattle is its first destination and it will continue to perform in 30 cities of the USA and Canada. For the first time, Rockstar Energy mayhem festival is being sponsored by Rockstar energy drink with other so-sponsors including Jagermeister, Hot topic and The Dingstore.com. Fuse Television and Revolver Magazine are its media partners whereas Live Nation is promoting the festival nationally. Rockstar mayhem is consisting of around 40 hard rock bands that are categorically divided into Main Stage, Jagermeister Stage and Hot Topic Stage. It's an American new metal band from Iowa. The band was officially formed in 1995 consisting of Sid Wilson, Joey Jordison, Chris Fehn, Paul Gray, Jim Root, Shawn Crahan, Craig Jones, Corey Taylor and Mick Thomson. The band has released its three albums to date and is working on the forth album. Its debut album was Slipknot released in 1999 and the forth album is expected to be available in markets in September 2008..
Slipknot musical influence includes hip hop, extreme metal and industrial. The band plays lead, bass and rhythm guitar. There're two percussionists in addition to the primary drummer, and electronics. The band music is a fine amalgam of diverse vocal styles and melodious & rapping singing. However the lyrics rather follow an aggressive tone. The band was officially formed in 1996 and is consisting of David Draiman, Dan Donegn, Mike Wengren and Steve Fuzz Kmak. Disturbed is a nu metal rock band from Chicago, Illinois. But, its genre is being debated as it is generally regarded as heavy metal or hard rock band by some music critics. However there is also a quarter of people which consider it as alternative metal. When David Draiman was asked about Disturbed fans not finding it heavy enough he replied, We probably have too much melody going on or we're not quite as turbulent or caustic. While I really love that type of music, it's not what we try to do. If we have to place things in context, we're more hard rock than heavy metal these days. To date Disturbed has released three albums named "The Sickness", "Believe" and "Ten Thousand Fists". The band has scheduled to release their fourth album "Indestructible" in June 2008. An English power metal band DragonForce was formed in London in 19999. The band soon gained popularity among masses for its twin guitar solos, fast paced songs and incorporation of video games music in to their music. Unfortunately, DragonForce had to go through many transitional phases several times. The members associated with band currently are Herman Li, Sam Totman, ZP Theart, vadim Pruzhanov, Dave Makintosh and Fredrick Leclercq. 'Valley of the Damned', 'Starfire', 'Through the fire and Flames' were amongst their hit songs they sung. Till date they have produced two albums Sonic Firestorm and Inhuman Rampage. Their latest album is scheduled to be launched in August 2008. Mastodon got public recognition soon after it was formed. Mastodon is a heavy metal music band from Georgia and appeared for the first time in 1999. It is also regarded as Groove metal, Progressive metal and Sludge metal for it has always come up with variation and diverse music. Its members include Brann dailor, Brent hinds, Troy sanders and Bill Kelliher. The band has released several albums-a hit after hit. Lifesblood, Remission, Blood Mountain, Call of the Mastodon, leviathan etc are amongst their albums that did large scale business. Mastodon was also nominated for Grammy Award. Machine head is a heavy metal band from California formed in 1992. Key figures forming the band are Robb Flynn, Adam Duce, Dave McClain and Phil Demmel. The group has been under pressure by continuous changes and drug abuse since its formation. 'Burn My eyes'-the debute album- was a success. 'The burning red' was another bead of the garland and released in 1997. Later Machine Head released 'Supercharger','Through the Ashes of Empires' and 'the Blackening' in 1997. Machine Head was also nominated for Grammy Award in 2008. It's an Australian hard rock band that gained a steady popularity for their pub-rock sounds. The group is regarded as heavy metal by music critics. It hit the music industry with two albums 'ready to Rock' and 'Runnin' wild' that gave them more commercial success. Airbourne has also been nominated for several awards. An American Crushcore band is consisting of Ivan Moody, Zoltan Bathory, Darrell, Roberts, Matt Snell and Jeremy Spencer. The group is currently working with firm Music and has launched two albums 'Pre-Emptive Strike' and 'The way of the Fist under their umbrella'. The music produced by the band also carries the genres like groove metal and thrash metal. Underoath is a Grammy nominated band formed in 1998. They are working with Solid records and are the label's best selling group. Having gone through several line-up transitions, the band left with only one original member, Aaron Gillespie. In the beginning, Underoath came up with a more metal sound. Now they're playing metalcore and screamo. Their albums include 'They're Only Chasing Safety' and Define the Great Line. However, Underoath is planning to release another album in 2008. How do I know mayhem festival 2019 cheap tickets atlanta georgia event prices you are offering are the lowest in the market? All you need to do is go through the pricing section of our website and you will find out that we indeed are offering best value for your money regarding Rockstar Energy Mayhem Festival Tickets prices. What does ga on tickets to mayhem festival mean? Ga on tickets to mayhem festival means that the tickets are open for general admission and seats will not be reserved in advance, rather allotted on first come first serve basis. What is the best place to buy cheapest mayhem fest tickets? The best place to buy Rockstar Energy Mayhem Festival Tickets at the cheapest prices is to get them from our website. Log on to our homepage and book your tickets now. Hi, i want to purchase mayhem fest 2019 tickets, is your site safe? Certainly, we offer our customers a 100% guarantee and have been verified by TRUSTe and HackerSafe. Buy your Mayhem Fest 2019 tickets with complete peace of mind. I seem to have misplaced my mayhem fest tickets cheap. What should I do now? I'm afraid you will have to buy new Rockstar Energy Mayhem Festival Tickets as we don't have a refund policy or issue new tickets. Do you sell cheap mayhem festival tickets here on your website? Yes, we do sell cheap rockstar energy mayhem festival Tickets on our website. Look through our page and order today! What is the mayhem festival cincinnatti schedule? Please take a look at our Rockstar Energy Mayhem Festival Cincinnati OH for details about the latest schedules. Are mayhem festival discount codes available with you? Rockstar Energy Mayhem Festival Tickets on codes are available with us so log on to our site to avail them. What is the best place to get the mayhem festival tickets? 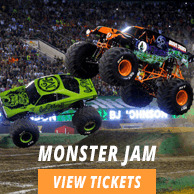 Ticketluck is no doubt the best place to purchase the Rockstar Energy Mayhem Festival Tickets. How can I get the mayhem tour discount code from you? Rockstar Energy Mayhem Festival Tickets on codes can be obtained after logging on to our site. What are the dates for mayhem festival phoenix? You can get the details about the event from the page of mayhem festival phoenix tickets. What are the required forms of payment for offer code for rockstar mayham tickets? Rockstar Energy Mayhem Festival Tickets can be bought via a master, visa or credit card. When will you charge me for cheap mayhem fest tickets? Within one business day we will charge for Rockstar Energy Mayhem Festival Tickets. Hey, when do i get the rockstar mayhem tickets if I order them today? Rockstar Energy Mayhem Festival Tickets will be delivered in about two weeks time. What is the validity period for rockstar mayhem fest promo code at your site? Rockstar Energy Mayhem Festival Tickets are valid till the day of the event. rockstar energy mayhem festival tickets where to get from?